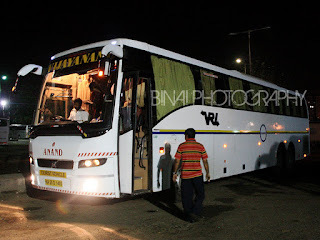 It was a happening trip to Chennai - spent two rocking days doing busfanning. The first days roaming literally burnt me - my complexion changed dark. At the sun set on the second day, it was time for me to get packing. The ticket for my return journey was booked long back - much before I book the ticket for my onward journey. I am still not sure about the rationale for selecting VRL - but I chose it and booked the ticket through their website, getting a 5% discount on the rate. The bus was almost empty when I booked the ticket. I somehow like the VRL website for its simplicity, and limited use of graphics/images. A few hours to go for my bus, my phone beeped... "BINAI SANKAR Your Bus Number is KA25D1403 Departures from Koyambedu(OMNI BUS STAND)". I was happy - its a new bus for me! I had nothing much to do in my hotel room - so checked out, and headed to the restaurant downstairs for a good dinner. After dinner, I took an auto from my hotel to the Omni bus station - it was just a short distance away, but had luggage. My bus was still about an hour away - so just kept walking around the bus station without any aim. The bus station was almost deserted - most bus bays were empty. I was actually enjoying wandering around the empty place. The KPN bays were active - they had a lot of buses at that time, and most of them were monsters aka Multi-axle Volvos. After some time of roaming around, I reached back outside the VRL Agent in CMBT -Senthil Travels. Showed the ticket there and waited outside the shop. The NJK Mercedes Benz sleeper to Coimbatore was parked there. Around 2300hrs, I saw my bus rolling into the bus station. Boarding started immediately after it came in - I was surprised to see that majority of the passengers were boarding from CMBT - I thought Central would contribute the maximum. Boarding was swift - the driver was checking the tickets at the door itself. I understood that there was only one driver and one attendant - that's actually a good idea for such a short route. I settled on my seat as the attendant came around to take a headcount - he gave a go ahead, when a passenger got off the bus to use the washroom. We started off at 2317hrs, as soon as the passenger came back. That was a two minute delay at the origin. The bus slowly crawled out of the bus station and got on to Ponamalle High Road. The driver stopped just after the flyover to talk to another VRL bus there (the AC Sleeper which left just before us). The talk was short - the bus got moving quickly. The driver was lugging the engine big time - it was making a hell lot of noise and was vibrating madly. A couple of KaSRTC buses overtook my bus with ease - now that was something I really was shocked at. Given the way the bus was being driven, I had no hope of making it to Bangalore anywhere close to the scheduled arrival time. I decided to make good use of the slow run - had a very nice, continuous sleep. I woke up around 4AM, and the bus was nearing a toll gate - I was sure we were at Krishnagiri. Did not want to waste time - so just closed the curtain and continued my sleep. I woke up again around 25 minutes later - and had the shock of my life - we were running through Singasandra then! OMG! So the toll gate I saw was Attibelle, not Krishnagiri! By the time I came to my senses, the bus rolled past my stop - Bommanahalli! My co-passenger was still asleep and I really had to struggle to wake him. By now, the attendant shouted out "Silk Board". I finally got off there at 0435hrs. The Scheduled arrival in Bangalore is only 0530hrs!! End remarks: The bus, KA-25-D-1403, was maintained in fairly good shape. The odo reading was around 2 lakh kms - did not really note down the number. The interiors were in good shape - the seats had fake-leather/canvas upholstery. The driving was awful - he lugged the engine badly - but maintained time. The end-to-end running time came out to a comfortable 5h18m only! The ride was very sleep friendly as well, and the icing is a stable fare structure! I feel VRL is one of the best bets on this route - the driving is very sleep friendly and fares are really proportionate! Will I take this service again? Sure! Will be my priority on this route.